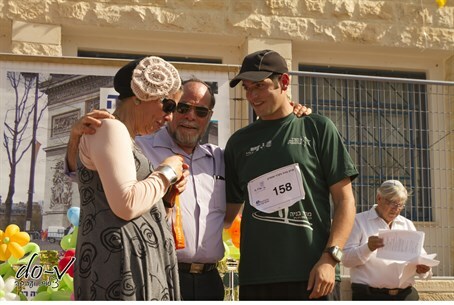 Aharon Karov, who recovered from critical wounds, gives his marathon medal to fallen soldier’s parents. The town of Karnei Shomron in Samaria (Shomron) hosted a race Friday in memory of Benaya Rein, who was killed in the Second Lebanon War. The race in Benaya’s memory has become an annual event. Among those racing was Aharon Karov, who famously went to war in Gaza the day after his wedding. He was critically wounded in battle, but recovered and this year managed to run in the New York City marathon. During the memorial race Friday, Karov met with Benaya Rein’s parents and gave them the medal he had won in the marathon. Benaya’s mother Hagit said Karov’s gesture had come as a surprise. “Aharon Karov really moved me. I didn’t know he was coming up to give us the medal,” she said. “He had told us he was going to the marathon in New York and would dedicate it to Benaya… He said Benaya’s spirit gave him strength. Now his medal is hanging on the wall next to Benaya’s medal from the Paris marathon,” she said. Benaya died in 2006. Before he died, he managed to save several fellow Israeli soldiers in Lebanon. When Aharon Karov was wounded two years later, Hagit Rein recalled, she prayed for his recovery – and asked Benaya’s spirit to intercede on Aharon’s behalf, as well. The race is always an emotionally difficult time, but also immensely rewarding, she added. “There have been people Benaya saved when they were injured soldiers, and that’s very hard… These are the things that strengthen us, but require strength – but it gives more than it takes,” she explained.